Types of Art: Most Mende art is associated with initiation and healing and includes wooden masks, twin figures, and medicine objects. Utilitarian objects such as heddle pulleys are decorated with carved heads or other beautiful designs. Religion: Ngewo is the creator and ruler of the universe and is assisted by the ancestors and other spirits (Nga-fa). Both are appealed to for protection and fertility for the community and the individual. All manifestation of the spirit, including the masks that are performed for religious ceremonies, are considered Nga-fa. The masks are carved to be aesthetically pleasing to the spirits. It is hoped that through its continual use the spirits will agree to embody the dancer during the ceremony. 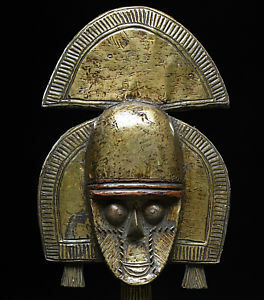 Interestingly, the Bondu helmet mask, which is associated with the Sande society and is found throughout Sierra Leone and western Liberia among numerous ethnic groups, is the only known masking tradition in Africa exclusively worn by women. Although women throughout Africa often act as intermediaries between the spirit world and the earthly world, there are no other known examples of women using masks.